National Primary Leaving Examinations (PLE) results were released on Tuesday morning with 86.3% candidates having passed. The National Ordinary Level results were also announced, with 89.9% have passed, indicating an increase of 0.9% rate in success in general. Among those who succeeded in PLE, girls performed better than boys at 55.5% compared to 44.5% of the boys. In the ordinary level, girls succeeded at the rate of 52.05% while boys succeeded at 47.95% rate. Generally, in both primary leaving examinations and ordinary level of secondary education in 2016, girls had succeeded at the rate of 55.1% while boys had succeeded at 44.9%. 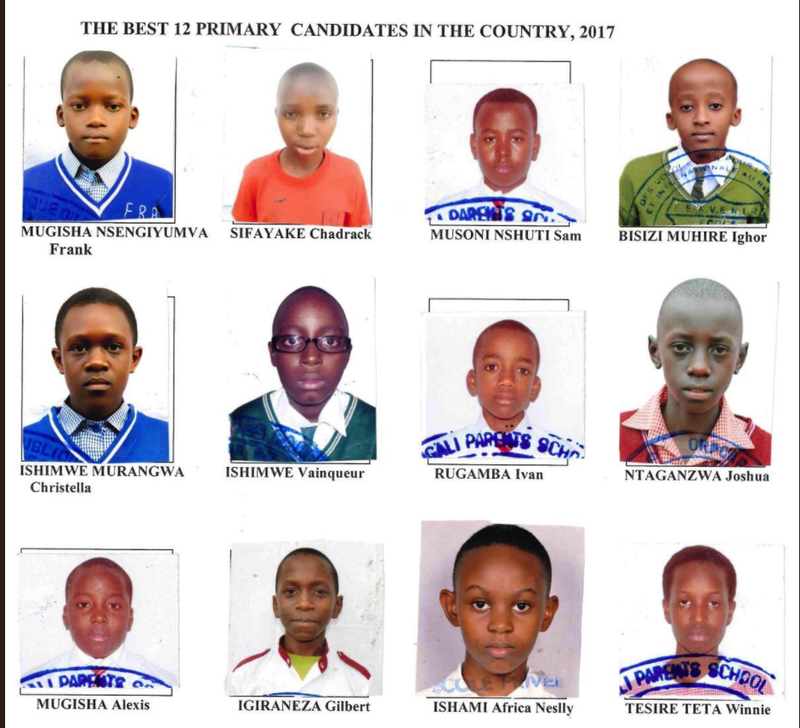 Nationally, Frank Nsengiyumva Mugisha from Muhanga District emerged as the first student in primary leaving exams while Joselyne Manzi from Gasabo District was the first in ordinary level. Division one had 11.14% (10,758 candidates) in 2017 compared to 11% in 2016. There were 38.07% (4,096) girls in Division one while 61.93% (6,662) are boys. Girls dominated in the category of best performing student in all subjects in Ordinary Level (seven girls to one boy). The Minister for State in Charge for Primary and Secondary Education, Isaac Munyakazi, who officiated the announcement of the results, said that there was an increase of candidates who succeeded in exams compared to those of the previous year. He attributed the success to the increase in number of candidates who sat for exams after education was made free. A total of 237,181 sat for primary leaving examinations in 2017, a significant increase from the 194,679 who sat for exams in 2016. For ordinary level of secondary education, 98,268 candidates sat for national exams in 2017, an 8% increase from the 91,492 in 2016. Out of these, female candidates are 53,618. “Lately, the government carried out intense campaigns to return students to school countrywide,” he said during the officiating of the exams at Groupe Scolaire Remera Protestant in Kicukiro District on November 21, 2017. Students are able to view their exam results online as it has been the case for the past years through both internet and short message service (SMS). To access results using internet, one, whether a student himself/herself or any other person (Parent or Guardian) logs in: www.reb.rw and click on “View exam results” and follow instructions while on SMS, one writes P6 (for Primary six), or S3 (for Ordinary level), followed by the full candidate’s index number and send to 489. On January 13, 2018, student placement information will be accessible online. Students will use the options highlighted above to access placement information. Meanwhile, the first term of 2018 academic year will begin on January 22 and end on March 29, 2018. The second term will start on April 16 to August 3, whereas the third term will start on August 21 and end on November 23, 2018. At 15, She Was Defiled, Impregnated, And Died. Where Is The Defiler?